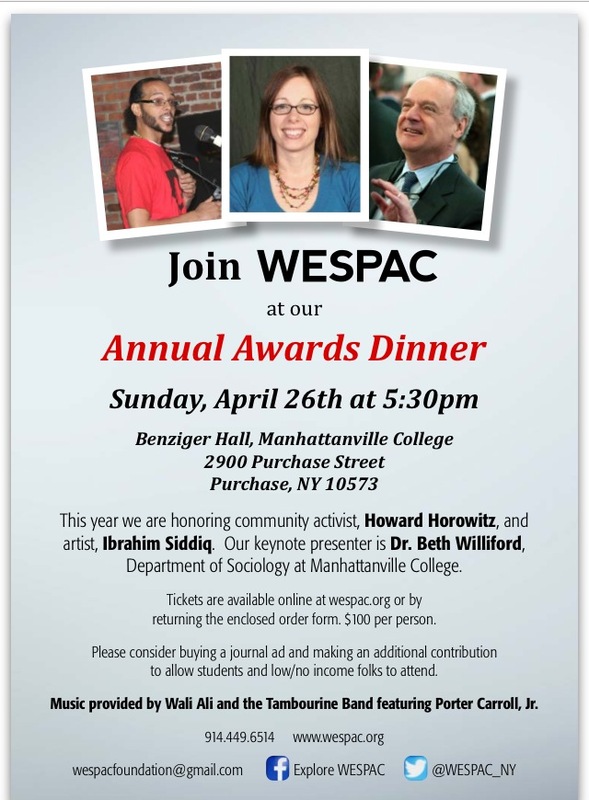 Howard Horowitz has been a WESPAC activist since its founding in the 1970s, having served on the WESPAC Foundation Board and as Chairperson. A current focus of his work is bringing alternative Palestinian and progressive Jewish voices to Temple Israel of New Rochelle and to the wider community through the Westchester Jewish Council. He is an active organizer of the Westchester chapter of Jewish Voice for Peace. He has traveled extensively to Israel, studied Arabic in Tunisia, and has visited the Jenin Freedom Theater, Bi’ilin and other places of resistance in the West Bank and Jerusalem. He received an MA in Political Science (NYU) and is founder and president of Horowitz Research, a consumer and multicultural research firm located in New Rochelle, NY. Howard and his wife, Alisse Waterston, live in New Rochelle. Ibrahim Asad Siddiq aka P.O.E.T (Putting Out Eternal Thoughts) is an activist and philosopher rooted in poetry. Ibrahim has recorded two albums, “Spoken World” and “Nerd at the Cool Table” and has recently released a book of poetry entitled “Words in Black and White”. He is the Artistic Director of a grassroots arts program known as The FREE ART Project in which he facilitates workshops, open mics and showcases throughout NYC and Westchester County. He organizes workshops in various correctional facilities including Arthur Kill and the Phoenix Academy, a teen rehabilitation center in Westchester County. Ibrahim is the founder of Earth’s Pantry, a skin and hair care product line made from organic plant based ingredients where the proceeds are used to fund The FREE ART Project. Beth is from the small town of Griffin, Georgia. She attended Wesleyan College, a women’s college in Macon, Georgia earning a Bachelor’s of Arts in Sociology. At Wesleyan she became a student activist and simultaneously developed a deep personal and academic interest in understanding progressive social movements. She went on to earn a Master’s and PhD in Sociology at Purdue University. Her dissertation research took her to the Ecuadorian Amazon. There she learned directly from indigenous communities about the impacts of natural resource extraction and how they have organized to resist the destruction of their lives, territory, and culture. Today, Beth is Chair of the Sociology-Anthropology Department at Manhattanville College where she teaches Sociology and Women’s and Gender Studies classes.